The Lifestyle Eating and Activity Programme (LEAP) is a free, weekly weight management group supporting adults that are overweight to lose weight gradually through a balanced diet and regular, moderate exercise. LEAP can help improve a number of health conditions that include type 2 diabetes, high blood pressure and depression. 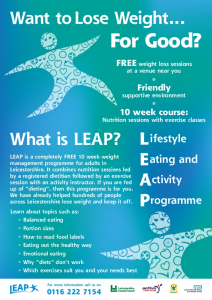 Supported by Harborough District Council's Active Together programme, LEAP is different to other weight loss programmes, not only will you have the support of a NHS-trained dietitian for 10 weeks, but the support of other group members. Together, you will lose weight gradually and safely and learn how to keep the weight off for good by healthy eating and increasing your activity levels. Not everyone is used to taking regular exercise (because of e.g. an existing health condition, poor mobility) but do not be put off from joining us. Our expert exercise instructors will tailor the exercises to your level of fitness and help you build your activity levels gradually. Research demonstrates that people who do regular activity have a lower risk of many chronic diseases, such as heart disease, type 2 diabetes, stroke and some cancers. At the end of the 10-week course, you can continue to attend regular weigh-ins and exercise classes (Choose to Move)* along with members of your group. Classes last approximately 2 hours. Start days / dates and times for these sessions will be confirmed once you have registered. So, if you or someone you know wants to join a successful weight management programme and lose up to a stone in weight, call 0116 2227154 now to book a place or speak to a dietitian in confidence about whether this programme is suitable for you. *There will be a small charge for the follow-on, Choose to Move exercise classes.